Sam, aged 19 from Bailey, Colorado, graduated from the Professional Welder program at Tulsa Welding School in April 2018. Thanks for sharing your story, Sam. Did you go to welding school straight out of high school? I worked over the summer to save up some money, then moved down to Oklahoma. It was something that I enjoyed doing. I first picked welding up as a sophomore in shop class. I was pretty good at it, and I enjoyed it, so I decided it wouldn’t be a bad profession to pursue. I looked into the money that welders make and the things I could do. It was appealing all around. I had no idea what I was going to do after high school until I picked up welding! Why did you decide to go to welding school? I’d been welding for about two years. I did a high school program at a community college my junior and senior years. I decided to enhance my skills and get a little more seasoned before I tried to enter the workforce. Tulsa Welding School was the best place to do that. Why did you think TWS would be the best place? The fact that the instructors at Tulsa have all the experience they do. The Career Services department was also a big seller for me. How was moving to Tulsa from small town Colorado at 18? Interesting! It was the first time I’d really been on my own and was my first experience with paying bills and taking care of myself. There was a learning curve and an adjustment period, but I got used to it. I moved from Colorado to Oklahoma, then eight months later from Oklahoma to Mississippi, so it’s been interesting bouncing around like this at such a young age. I didn’t turn 19 until I got to Mississippi. 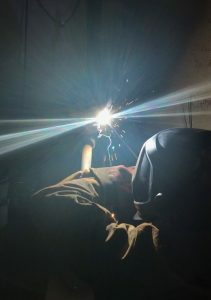 Before I got to Tulsa, I hadn’t done any pipe welding, so I really enjoyed learning how to weld pipe and the different processes that went along with it. The instructors were extremely good. Some were better communicators than others because they’re welders first, not necessarily teachers, but you can learn a lot by watching a master at his craft. They were all very knowledgeable and good at what they did. Did you have enough one-on-one time with instructors? Yes, absolutely, especially on shop days. Everybody works at their own pace, so if you you’re having trouble, chances are your instructor will be available because not everybody needs help at the same time. They were always available to help. How was the balance of bookwork vs. hands-on? It was fantastic. 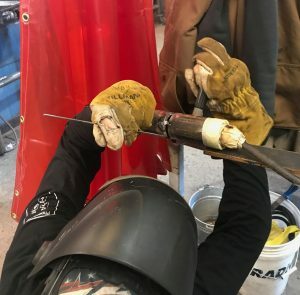 You’re only in the classroom for one day a week, and the other four you’re welding non-stop. You can’t learn to weld sitting in a classroom and studying a book. You’ve got to be out there doing it. It’s good that the curriculum focuses more on actually welding and less on the theory behind it. You said Career Services was a selling point for you. Did they help you? The résumé process was super easy. They had a template, and all we had to do was put in our personal details. That was around nine weeks before graduation. Once you do your résumé and talk with a Career Services rep—I worked with Christina Lantrip—they immediately start looking for job opportunities. What did you talk with Christina about? She wanted to get an idea about who I am and what I wanted to do. Then she started looking for jobs to pitch me to suit my goals. Then, of course, there are also the random companies that come through the school, weld testing anybody that wanted to test. It’s a good resource. They’re there to make the job search process is a lot less stressful and time consuming. I’m in Mississippi with Huntington Ingalls Industries, a shipbuilding company responsible for most of the Navy contract with our government. They came to the school in February and tested a bunch of people. I passed the weld test and they handed me a job offer on the spot. I graduated April 6th and my orientation date was April 20th. Flux core, mainly. I’m working on repairs to the USS Fitzgerald. It was a tragic event that you may remember. The ship collided with an oil tanker last summer, close to Japan, I believe, and we lost seven sailors. It was towed back to Mississippi for repairs. I was lucky enough to be put on the job to help fix it. Did you do anything exciting with your first welding pay check? I’m kind of a saver. I’ve got a motorcycle and a car from working through high school, so I’ve no need to buy anything super fancy. I’m tucking it away, paying back my student loans, money borrowed from family. I’m on $21 an hour with the second shift premium. After insurance, it comes out to about $630 a week, so it’s not big money necessarily, but for a 19 –year-old kid, it’s good money to start. Where do you hope your career will take you? The aerospace industry is where I want to aim my career. Whenever I’m done getting dirty welding, I’ll probably go for management or even upper management. The fact that I’ve got a skill and a trade. Having a career at such a young age is the best part of it for me. I’m worth something already. Did you make some good connections at school? I’ve still got buddies who I talk to pretty frequently. One of them is an iron worker back in Colorado. Another is doing fabrication work for a shop in Colorado, and another stayed in Tulsa for a CWI program. I also had a buddy from home who started at Tulsa straight out of high school, so a couple of months ahead of me. I’m going to stay in touch with Christina for as long as I can, too, because when I want to move on from here, she’ll still be able to help me find work. I want to have plenty of people who can help me find work. Go in with both feet. If you’re going to do it, do it all the way. Give it your best effort. Get as much out of it as you possibly can.